Camel’s hair Art Class Pack. 193 piece Camel’s hair assortment featuring Black rectangle Petite Tote with handle. Tote is 7-1/2″ X 5″ X 6″. 192 brushes and 1 tote. 12 each round sizes 1, 2, 3, 4, 6, 8, 10, 12. Flat sizes 1/4″, 1/2″3/4″, 1″. Camel Hair Wee Mop sizes 1/8″, 3/16″, 1/4″, 3/4″. ** This item is drop shipped directly from the manufacturer and may be packed and shipped seperately from the rest of your order. Camel’s hair Art Class Pack. 193 piece Camel’s hair assortment featuring Blue rectangle Petite Tote with handle. Tote is 7-1/2″ X 5″ X 6″. 192 brushes and 1 tote. 12 each round sizes 1, 2, 3, 4, 6, 8, 10, 12. Flat sizes 1/4″, 1/2″3/4″, 1″. Camel Hair Wee Mop sizes 1/8″, 3/16″, 1/4″, 3/4″. ** This item is drop shipped directly from the manufacturer and may be packed and shipped seperately from the rest of your order. Camel’s hair Art Class Pack. 193 piece Camel’s hair assortment featuring Red rectangle Petite Tote with handle. Tote is 7-1/2″ X 5″ X 6″. 192 brushes and 1 tote. 12 each round sizes 1, 2, 3, 4, 6, 8, 10, 12. Flat sizes 1/4″, 1/2″3/4″, 1″. Camel Hair Wee Mop sizes 1/8″, 3/16″, 1/4″, 3/4″. ** This item is drop shipped directly from the manufacturer and may be packed and shipped seperately from the rest of your order. Craft and Hobby Class Pack Assortment. Natural hair 85 piece Camel/Stencil Assortment featuring Black rectangle tote with handle. Tote is 7-1/2″ X 5″ X 6″. 84 brushes and 1 Petite Tote 12 each Silver Stencil sizes 10, 12, 14. Camel round large sizes 10, 12. Camel flat large sizes 3/4″, 1″. ** This item is drop shipped directly from the manufacturer and may be packed and shipped seperately from the rest of your order. Craft and Hobby Class Pack Assortment. Natural hair 85 piece Camel/Stencil Assortment featuring Blue rectangle tote with handle. Tote is 7-1/2″ X 5″ X 6″. 84 brushes and 1 Petite Tote 12 each Silver Stencil sizes 10, 12, 14. Camel round large sizes 10, 12. Camel flat large sizes 3/4″, 1″. ** This item is drop shipped directly from the manufacturer and may be packed and shipped seperately from the rest of your order. Craft and Hobby Class Pack Assortment. Natural hair 85 piece Camel/Stencil Assortment featuring Red rectangle tote with handle. Tote is 7-1/2″ X 5″ X 6″. 84 brushes and 1 Petite Tote 12 each Silver Stencil sizes 10, 12, 14. Camel round large sizes 10, 12. Camel flat large sizes 3/4″, 1″. ** This item is drop shipped directly from the manufacturer and may be packed and shipped seperately from the rest of your order. Crystal Golden Taklon with clear acrylic handle. 24 brushes includes 6 each square wash sizes 3/4″, 1-1/2″ and large oval sizes 3/4″, 1-1/2″ boxed. Perfect student watercolor brushes. ** This item is drop shipped directly from the manufacturer and may be packed and shipped seperately from the rest of your order. Faye White Bristle Thrifty Class Pack Assortment. With 109 piece Faye Bristle long handle Jumbo Size brushes. Featuring Black round Petite Tote with handle. Tote is 11-1/4″ X 7-3/8″. 108 brushes and 1 round petite tote 12 each Faye round size 8, 10, 12 flat size 8, 10, 12 bright size 8, 10, 12. ** This item is drop shipped directly from the manufacturer and may be packed and shipped seperately from the rest of your order. Faye White Bristle Thrifty Class Pack Assortment. With 109 piece Faye Bristle long handle Jumbo Size brushes. Featuring Blue round Petite Tote with handle. Tote is 11-1/4″ X 7-3/8″. 108 brushes and 1 round petite tote 12 each Faye round size 8, 10, 12 flat size 8, 10, 12 bright size 8, 10, 12. ** This item is drop shipped directly from the manufacturer and may be packed and shipped seperately from the rest of your order. Faye White Bristle Thrifty Class Pack Assortment. With 109 piece Faye Bristle long handle Jumbo Size brushes. Featuring Red round Petite Tote with handle. Tote is 11-1/4″ X 7-3/8″. 108 brushes and 1 round petite tote 12 each Faye round size 8, 10, 12 flat size 8, 10, 12 bright size 8, 10, 12. ** This item is drop shipped directly from the manufacturer and may be packed and shipped seperately from the rest of your order. Silver Stencil Class Pack Assortment. 133 piece Stencil assortment featuring 1 Black rectangle Petite Tote with handle. Tote is 7-1/2″ X 5″ X 6″. 132 brushes and 1 tote 12 each Stencil Mini, short handle sizes 2, 4, 6. Silver Stencil sizes 0, 2, 4, 6, 8, 10, 12, 14. ** This item is drop shipped directly from the manufacturer and may be packed and shipped seperately from the rest of your order. Silver Stencil Class Pack Assortment. 133 piece Stencil assortment featuring 1 Blue rectangle Petite Tote with handle. Tote is 7-1/2″ X 5″ X 6″. 132 brushes and 1 tote 12 each Stencil Mini, short handle sizes 2, 4, 6. Silver Stencil sizes 0, 2, 4, 6, 8, 10, 12, 14. ** This item is drop shipped directly from the manufacturer and may be packed and shipped seperately from the rest of your order. Silver Stencil Class Pack Assortment. 133 piece Stencil assortment featuring 1 Red rectangle Petite Tote with handle. Tote is 7-1/2″ X 5″ X 6″. 132 brushes and 1 tote 12 each Stencil Mini, short handle sizes 2, 4, 6. Silver Stencil sizes 0, 2, 4, 6, 8, 10, 12, 14. ** This item is drop shipped directly from the manufacturer and may be packed and shipped seperately from the rest of your order. Sterling Studio 4 piece brush set class pack assortments. Featuring 109 piece Sterling Studio sets with Black round Petite Tote with handles. Tote is 11-1/4″ X 7-3/8″, 108 Sterling Studio Sets. Each set has 4 Sterling Studio Golden Taklon brushes, sets include rounds, flats, brights, filberts, angles and spotters in a variety of sizes ranging from 20/0 to 1/2″. ** This item is drop shipped directly from the manufacturer and may be packed and shipped seperately from the rest of your order. Sterling Studio 4 piece brush set class pack assortments. Featuring 109 piece Sterling Studio sets with Blue round Petite Tote with handles. Tote is 11-1/4″ X 7-3/8″, 108 Sterling Studio Sets. Each set has 4 Sterling Studio Golden Taklon brushes, sets include rounds, flats, brights, filberts, angles and spotters in a variety of sizes ranging from 20/0 to 1/2″. ** This item is drop shipped directly from the manufacturer and may be packed and shipped seperately from the rest of your order. Sterling Studio 4 piece brush set class pack assortments. Featuring 109 piece Sterling Studio sets with Red round Petite Tote with handles. Tote is 11-1/4″ X 7-3/8″, 108 Sterling Studio Sets. Each set has 4 Sterling Studio Golden Taklon brushes, sets include rounds, flats, brights, filberts, angles and spotters in a variety of sizes ranging from 20/0 to 1/2″. ** This item is drop shipped directly from the manufacturer and may be packed and shipped seperately from the rest of your order. Watercolor Petite Class Pack Assortment. 91 piece large size Sterling Studio brush assortment featuring, Black rectangle tote with handle. Tote is 7-1/2″ X 5″ X 6″. 86 brushes, 1 Petite Tote, 4 Aqua Totes. 12 each round brushes sizes 6, 8, 12. Filbert size 8, fan size 4, angle size 1/2″, stroke size 3/4″, one piece each 2″, 3″ large flat blending brush, 2 red, 2 black Aqua Tote water buckets. ** This item is drop shipped directly from the manufacturer and may be packed and shipped seperately from the rest of your order. Watercolor Petite Class Pack Assortment. 91 piece large size Sterling Studio brush assortment featuring, Blue rectangle tote with handle. Tote is 7-1/2″ X 5″ X 6″. 86 brushes, 1 Petite Tote, 4 Aqua Totes. 12 each round brushes sizes 6, 8, 12. Filbert size 8, fan size 4, angle size 1/2″, stroke size 3/4″, one piece each 2″, 3″ large flat blending brush, 2 red, 2 black Aqua Tote water buckets. ** This item is drop shipped directly from the manufacturer and may be packed and shipped seperately from the rest of your order. Watercolor Petite Class Pack Assortment. 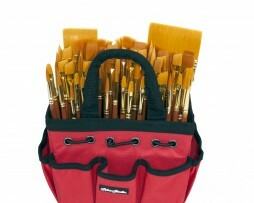 91 piece large size Sterling Studio brush assortment featuring, Red rectangle tote with handle. Tote is 7-1/2″ X 5″ X 6″. 86 brushes, 1 Petite Tote, 4 Aqua Totes. 12 each round brushes sizes 6, 8, 12. Filbert size 8, fan size 4, angle size 1/2″, stroke size 3/4″, one piece each 2″, 3″ large flat blending brush, 2 red, 2 black Aqua Tote water buckets. ** This item is drop shipped directly from the manufacturer and may be packed and shipped seperately from the rest of your order.